Background: Autism is one of the most common developmental disorders. It is a lifelong brain disorder that is normally diagnosed in early childhood. Autism is a spectrum disorder varying in severity and impact from individual to individual. Aims: The main purpose of this study is to find the effect of yogic intervention on children suffering from Autism Spectrum Disorder. Settings and Design: Thirty children suffering from Autism Spectrum Disorder were selected from Abhiprerna Foundation, Haridwar for the study. The age of the subjects ranged from 5 to 16 years. The design used for the study was pre-post design. Purposive sampling was used for collection of the sample. Methods: The current study was performed with parents/caregivers who gave information regarding the daily activities of the child; pre and post values for the study were assessed on the basis of the Childhood Autism Rating Scale. yogic practices including OM Chanting, Asanas, and Pranayama were used as intervention for a period of 3 months. Statistical Analysis Used: Paired samples t-test was used for comparing the means of pre and post values. Results: Though there was statistically significant reduction in the symptoms of autism in children after a period of 3 months, yet the effect size was very small to draw an assertive conclusion. Conclusions: The results conclude that continuous practice of yoga may significantly improve the symptoms of Autism Spectrum Disorder in children. Such an effect also calls for a detailed study on their effectiveness in the long run. The first few years of life are characterized by enormous physical development accompanied by still greater mental development. Early childhood is the period in which numerous forms of self-control begin to develop, and the emergence of voluntary self-control is clearly one of the most central and significant human capacities (Satyananda, 2006). During this period, if a child suffers from any developmental problems, it becomes extremely painful and perplexing for the parents as well as those who associate with them. Autism Spectrum Disorder (ASD) or autism is a pervasive developmental disorder defined by the presence of abnormal and/or impaired development. It involves rigid, repetitive behaviors, as well as, severe impairments in social interaction, communication and imaginative abilities. To be considered an autistic disorder, some of these impairments must manifest before the age of 3 years (Thackery & Harris, 2003). The Centers for Disease Control and Prevention (2012) estimates that 1 in 88 children in the United States has been identified as having an ASD. There has been a staggering rise in the number of autism cases in India as well. From an estimated 20 lakh cases in 2003, there are reportedly 1.36 crore autism patients in India (Times of India, 2012). According to DSM-IV TR (Diagnostic and Statistical Manual of Mental Disorders, Fourth Edition, Text Revision, 2005), the essential features of autistic disorder are the presence of markedly abnormal or impaired development in social interaction and communication and a markedly restricted repertoire of activity and interests. Some children with autism initially develop an instrumental form of joint attending (shared focus of two individuals on an object by means of eye-gazing, pointing or other verbal or non-verbal indications) to get a specific need met, but they may fail to generalize the capacity to more purely social situations in which a child typically seeks to share his pleasure in an activity with a caregiver. Later, the lack of mutuality becomes expressed as a lack of peer relations wherein the child, lacking affiliative drive, tends to neither imitate nor join other children because there is no shared frame of reference for the potential relationship. Finally, atypical social interactive qualities manifest as a lack of sympathy, empathy, or any other acknowledgment of reciprocal experience (Siegel & Ficcaglia, 2006). The study of Singhi and Malhi (2001) revealed that the major characteristics observed and reported for the majority of children diagnosed with autism were impairment in use of non-verbal behavior, absence of imaginative play, lack of social and emotional reciprocity, restricted range of interests, no mode of communication (whether verbal or non-verbal) or delay in communication, and impaired peer relationship. The results from this study also suggest that deficits in social interaction, play, and communication may be more prominent in autistic children less than 4΍ years of age. Malhi and Singhi (2005) also redirected that impaired development of social skills and superior physical skills may reflect an inherent difference between the children with and without autism. Parents recognized a range of symptoms as problematic, with a large percent of the families noticing social difficulties first. The social impairment of young children with autism can, indeed, be distinctive in some cases, while it may by more subtle in others (Daley, 2004). The study conducted by Kalra, Seth, and Sapra (2005) in concordance with literature also revealed a male preponderance for autistic disorder, with a higher male: female ratio of 8:1. Children with autism frequently react paradoxically to particular sensory stimuli, being sometimes hypersensitive and sometimes indifferent to certain stimuli or pain. A descriptive hospital-based study of children with autism by Juneja, Mukherjee, and Sharma (2005) revealed that 56% of parents reported that their children felt, smelt, or tasted things deviantly. There are different interventions and supports through which an autistic child develops and acquires social and learning skills, for example, medications, occupational therapy, physical therapy, speech-language therapy, etc.But the most effective form of therapy is an early, intensive, appropriate treatment program built on the interests of the child in a highly structured schedule of constructive activities. Yoga is a powerful tool that can teach children how to connect to their bodies, tap into their own personal strength, better deal with life's challenges, and build connections with the outside world (Ehleringer, 2010). In a study comparing children with autism who did Yoga each day at school compared to kids who followed a typical routine instead, those who participated in the stretching exercises exhibited significantly less aggressive behavior, social withdrawal, and hyperactivity (Heasley, 2012). According to another research by Hadi and Hadi (2007), yogic practices can be used as psychophysiologic stimuli to increase endogenous secretion of melatonin, which, in turn, might be responsible for improved sense of well-being. Yogic approach is based not only on promoting health, but also on promoting the well-being and personal fulfillment, and should be used as part of one's lifestyle. The focus in Yoga therapy is on the state of physical fitness, mental alertness, and social adjustment, aligned with the biorhythm of nature, and spiritual development. It, thus, aims for making the person a better contributor toward self, family, society, and nature at large. Autism involves a wide range of problematic behaviors, including deficits in language, perceptual, and motor development; defective reality testing; and an inability to function in social situations (Carson, Butcher, & Mineka, 2004). Yoga practices may help improve these symptoms and gradually reduce the severity of autism. There is a significant effect of yogic intervention on the symptoms of autism in children suffering from ASD. Thirty children suffering from autism were selected from Abhiprerna Foundation, Haridwar for the study and were given yogic intervention for a period of 3 months. The age of the subjects ranged from 5 to 16 years. Purposive sampling was used for the collection of the sample. Single group pre-post design was used for conducting the present study. The Childhood Autism Rating Scale (CARS) by Schopler, Reichler & Renner (1988) is a well-established instrument for the screening and diagnosis of childhood autism. There are 15 items in CARS: 1) Relating to people; 2) Imitation; 3) Emotional response; 4) Body use; 5) Object use; 6) Adaptation to change; 7) Visual response; 8) Listening response; 9) Taste, smell, and touch response and use; 10) Fear or nervousness; 11) Verbal communication; 12) Nonverbal communication; 13) Activity level; 14) Level and consistency of intellectual response; 15) General impressions. Each scale is rated with a score of 1 (with normal for child's age), 2 (mildly abnormal), 3 (moderately abnormal), or 4 (severely abnormal). Midpoint scores of 1.5, 2.5, and 3.5 are also possible. Total CARS scores range from 15 to 60, with a score of 30 serving as the cut-off for a diagnosis of autism. Average Reliability of CARS is 0.71 and Validity is 0.83. Total practice time: 1 h in the morning. The results of paired t test offer support for the hypothesis. They are displayed in [Table 1] and their graphical representation is presented in [Figure 1]. Though there was statistically significant reduction in the symptoms of autism in children after a period of 3 months at 0.01 level of confidence, yet the effect size was very small to draw an assertive conclusion. The results of the study indicate that though there was statistically significant reduction in the symptoms of autism in children after a period of 3 months at 0.01 level of confidence, yet the effect size was very small to draw an assertive conclusion because the change in the score was by a magnitude of 1/40 only. The results conclude that continuous practice of yogic disciplines may be helpful and significantly improves the symptoms of ASD in children in the long run. According to Swami Satyananda (2005), Yoga is a definite means of physical, mental, emotional, and spiritual development, as it improves, strengthens, and develops both the physical and mental personality. Everybody wants a fit and efficient body and mind. The mind and body act and react on each other. Mental ailments cause physical ailments and vice versa. According to a research by Gurjar, Ladhake, and Thakare (2009), chanting OM mantra results in stabilization of brain, removal of worldly thoughts, and increase of energy. It means that concentrating on OM mantra and continuously doing it slowly shifts our attention. Asanas are a part of Yoga therapy and are special patterns of postures that stabilize the mind and the body through static stretching. The physical functioning becomes more integrated and less stressful. The main objective of asanas is to stimulate and harmonize the circulation of energies and increase their absorption. Of course, at the same time, they also bend the spine forward and backward, or twist it to ensure total flexibility and stimulation of the nerve centers of the spinal cord and the sympathetic system (Lysbeth, 1979). Pranayama controls and regulates breathing and is very beneficial for the autistic. Deep breathing and Nadi Shodhan Pranayama particularly improves the stamina, balance, and strength, along with inducing better sleep by the improved circulation of the Vital Energy. Vital Energy is the body's innate intelligence or life force that gives humans the property of life. According to yoga, Vital Energy is the Pranic energy of the body. Conscious breathing can also help release deeply held physical and emotional tension within the body. Although the available data in the form of research is quite limited, the efficacy of yogic practices in improving the quality of life in autistic children cannot be ignored. Available studies support the fact that Yoga therapy can be used as a treatment for reducing the symptoms of autism. Radhakrishna (2010) in his study investigated an integrated approach to Yoga therapy for a period of 10 months as a treatment method in children with ASD to increase imitative skills and found that children exhibited increased skills in eye contact, sitting tolerance, non-verbal communication, and receptive skills to verbal commands related to spatial aspects at the end of the study. In another study, Radhakrishna, Nagarathna, and Nagendra (2010) studied a specially designed Integrated Approach to Yoga Therapy module for ASDs over a period of two academic years. Their study included children aged 8-14 years from middle class families, who received an hour of Yoga therapy a day. The Yoga practice was broken down into different exercises under the following categories: warm-up, strengthening, release of tension, and calming. By the middle of the sessions, improvements were observed. They included eye contact, ability to sit for long period of time, and improvement in body posture. After 2 years of integrated Yoga therapy, therapist and parents noted much success and found that guided imitation of therapist body positions stimulated mirror neuron activation, resulting in improved sense of self. Sequeira and Ahmed (2012) reviewed meditation as a potential therapy for autism and suggested that mantra meditation may be most useful intervention for children between 3 and 14 years of age to improve health outcomes. In the present study, there was some improvement in the symptoms of autism at the end of 3 months, but the magnitude of effect was quite small. Therefore, the results for an effective therapeutic plan cannot be generalized. The review of literature also suggests that longer practice time is required to have a positive effect. The current study was further continued for a period of nine months on the basis of the visible improvements. The study may show more progress on implementing Yoga practices for at least a year. The research also encourages parents and caregivers to explore Yoga as beneficial activity for the symptoms of autism. Thus, the current research concludes that continuous practice of yoga for at least a year may gradually and significantly improve the symptoms of ASD, so that children suffering from autism can develop the skills as well as understanding required to live a less chaotic life and have an improved sense of self. Centers for Disease Control and Prevention (2012). CDC estimates 1 in 88 children in United States has been identified as having an autism spectrum disorder. Retrieved July 11, 2013, from http://www.cdc.gov/media/releases/2012/p0329_autism_disorder.html. Carson, R. C., Butcher, J. N., & Mineka, S. (2004). Abnormal Psychology and Modern Life. (pp. 565). Delhi: Pearson Education. Daley, T. C. (2004). From symptom recognition to diagnosis: children with autism in urban India. Social Science and Medicine, 58 (7), 1323-1335. DSM-IV TR (2005). Disorders usually first diagnosed in Infancy, Childhood, or Adolescence (pp. 75). New Delhi: Jaypee Brothers. Ehleringer, J. (2010). Yoga for Children on the Autism Spectrum. International Journal of Yoga Therapy, 20 (1), 131-139. Gurjar, A. A., Ladhake, S. A., & Thakare, A. P. (2009). Analysis of Acoustic of "OM" Chant to Study its Effect on Nervous System. International Journal of Computer Science and Network Security, 9 (1), 363-367. Retrieved from http://search.ijcsns.org/02_search/02_search_03.php?number=200901051. Hadi, N., & Hadi, N. (2007). Effects of Hatha Yoga on Well-Being in Healthy Adults in Shiraz, Islamic Republic of Iran. East Mediterranean Health Journal, 13 (4), 829-837. http://www.emro.who.int/emhj-list/emhj-volume-13-2007/vol13-issue4.html. Juneja, M., Mukherjee, S. B., & Sharma, S. (2005). A descriptive hospital based study of children with autism. Indian Pediatrics, 42 (5), 453-458. Kalra, V., Seth, R., & Sapra, S. (2005). Autism -experiences in a tertiary care hospital. Indian Journal of Pediatrics, 72 (3), 227-230. Malhi, P., & Singhi, S. (2005). 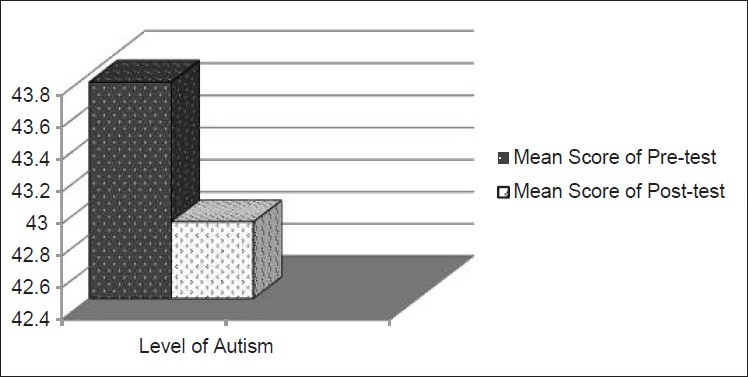 Patterns of development in young children with autism. Indian Journal of Pediatrics, 72 (7), 553-556. Radhakrishna, S. (2010). Application of integrated yoga therapy to increase imitation skills in children with autism spectrum disorder. International Journal of Yoga, 3 (1), 26-30. Schopler, E., Reichler, J., & Renner, B. (1988). The Childhood Autism Rating Scale (C.A.R.S.). Los Angeles: Western Psychological Services. Sequeira, S.,& Ahmed, M. (2012). Meditation as a Potential Therapy for Autism: A Review. Autism Research and Treatment, Article ID 835847, 11 pages. doi: 10.1155/2012/835847. Siegel, B., & Ficcaglia, M. (2006). Pervasive Developmental Disorders. In M. Hersen & J. C. Thomas (Eds. ), Comprehensive Handbook of Personality and Psychopathology Vol. 3: Child Psychopathology (pp. 255). New Jersey: John Wiley & Sons. Singhi, P., & Malhi, P. (2001). Clinical and neurodevelopmental profile of young children with autism. Indian Pediatrics, 38 (4), 384-390. Swami Satyananda (2005). Yoga Therapy. Retrieved July 21, 2013, from http://www.yogamag.net/archives/2005/lnovdec05/yogther.shtml. Swami Satyananda (2006). Yoga Education for Children. Vol 1. (pp. 26). Munger: Bihar School of Yoga. Thackery, E., & Harris, M. (Eds.). (2003). The Gale Encyclopedia of Mental Disorders Vol 1. (pp. 97). USA: Thomson Gale Pub. Times of India (2012). Six-fold rise in autism cases in India. Retrieved July 20, 2013, from http://articles.timesofindia.indiatimes.com/2012-04-01/hyderabad/31269635_1_autism-cases-world-autism-day-autistic-patients.